Home » Our insights » Blog » The IPID - doomed to fail? The IPID - doomed to fail? The IPID will soon be a mandatory companion for most insurance products. But has it failed before it's begun? The production of an Insurance Product Information Document (IPID) will be a requirement for all non-life insurance products from 23rd February - though this will most likely be pushed back to 1st October [this has now been delayed - see footnote]. We’ve already shared some thoughts on the IPID here. But following the release of Ecclesiastical’s IPID attempt, I wanted to take an in-depth look at it to see if our scepticism around this piece of regulation was warranted. The EU directive states that IPIDs should be available online and in print, and be available before conclusion of the sale. The key features across various insurance products should be standardised – though nothing’s stated in the directive as to what these should be. The IPID should be clear and easy to read, and be accurate and not misleading. But the only specific prescriptions relate to the use of headings. However, these could change as well, as long as the information it’s asking for is provided. Finally, insurers must stick to the design template shown above. This was meant to be consulted on over the past year, but it seems that no progress has been made public. First of all, hats off to Ecclesiastical for releasing their IPID. Many providers are unsure of how to tackle this, so it’s good to see them take the initiative. Unfortunately, because of the inherent flaws of the regulation, it’s not very good. This is very vague, considering that the IPID is intended to allow customers to easily compare products on key aspects of cover. Unless the information is exact, this goal is not achieved. As well as this, three out of 12 key features of the cover are stated to be up to the limit “shown in your schedule”. This document is meant to provide key information before completion of the sale. Yet it signposts the customer towards the schedule, which is only available after completion of the sale. 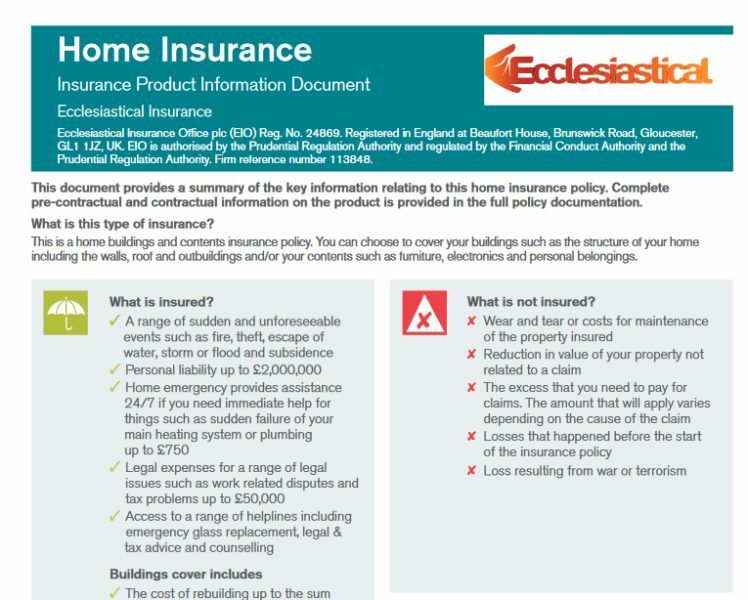 This points to another issue with this insurance document. There’s some information that needs to be stated which can’t be standardised – it relies on the choices of the individual customer. For example, answering the header “When does the cover start and end?”, the document states that it starts “on the date we have agreed with you”. On top of this, “When and how do I pay?” is answered with “you can either pay for your policy in full or by instalments”. This is information that can only be made clear within the product journey, where the customer decides how to pay, and when to take out the policy. Therefore, forcing the inclusion of this information in the IPID seems misguided. There are further issues with the document. These are summed up well by this statement: “There is no cover for the cost of replacing any undamaged items which form part of a pair, set suite or matching design”. This is very useful to state, as according to our research 58% of consumers expect this to be covered to some extent, and often it isn’t. However it’s included in the “Are there any restrictions on cover?” section. Yet it seems more at home in the “What is not insured?” section. Furthermore, “What is insured?” contains information on cover, up to certain limits. Surely these limits are the restrictions on the cover, rather than what’s insured? So what belongs where? Hopefully you can see that the failings of this document are not Ecclesiastical’s, but of the regulation itself. Rather than explain key information in an easily digestible way, I imagine providers will simply lift clauses from their often incomprehensible policy documents. The design is limiting, causing confusion as to what belongs where. There’s nothing to indicate what the key features stated should be. Nor any consumer research into which features are the most frequently claimed on, or the most misunderstood. Furthermore, the IPID will become yet another document provided when buying insurance. Consumers have already got policy documents, summary documents, and terms of business to contend with. Adding another few pages surely won’t help consumers’ general apathy towards reading these documents. And, as is common with prescriptive regulation, many providers will feel as if they’ve ‘done enough’. Adhering to the standards of this flawed regulation will likely be as far as they feel they need to go to explain the product to the customer. They’ll see it as another box ticked. The use of rhetorical headers is good. They allow customers to navigate the IPID easily, finding answers to their specific questions. They are also written in plain English, except for “What are my obligations?”. The cancellation terms are clearly stated. And as mentioned above, stating that matching suites aren’t covered is useful, though the language isn’t great. Other than that, I’m struggling to see the benefits of this document. Put simply, make existing summary documents better. The IPID has only really come into effect because summary documents are failing to do what they’re meant to do. And the IPID will most likely follow suit. A greater number of regulatory obligations is no replacement for driving genuine cultural change. There is, however, an opportunity to use regulation positively here, such as mandating a certain reading grade for summary documents. This may sound strange, but US states such as Florida and Minnesota have state laws to ensure insurance documents achieve a certain readability score. And existing regulation could be more stringently enforced. Providers are required to itemise which fees apply to a particular product. However, insurance fees remain unjustifiably opaque. Forcing them to be surfaced in a clearly written summary document would be a huge, and long overdue, step in the right direction. Having said this, just because the IPID isn’t the most innovative piece of regulation in the world, there’s no reason why providers can’t make a success of it. Keeping the language simple, and using consumer research to back up which key features should be included would be a great place to start. Update: The implementation of the IDD has now been delayed until 1st October 2018.